Club Penguin Cheats by Mimo777 Club Penguin Cheats by Mimo777: Club Penguin Mountain Stamp News! The Mountain Expedition will be here soon and we still do not know much more about it except that jet packs can not take us high enough to know what it at the top. And the only way to get to the bottom of this mystery is to climb to the top of the Mountain. 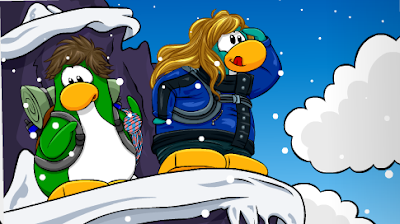 So, join the expedition at the Ski Village on August 13th! Sweet! There's some pretty awesome gear going to be available for this event, don't you think? As we reported yesterday, Puffle Rescue stamps will be coming. Along with lot of other stamps. Club Penguin has confirmed there will be new stamps EACH month! Woot! Have you earned lots of stamps? Have you earned all that is possible? I have been too busy to earn very many. But, it so much fun to do with buddies, you better watch out... I smell a quickie stamp party coming. And yes, I think there will be a stamp for the Mountain Expedition, how 'bout you? Cool! I can't wait until the Mountain Expedition party!! I've already said this in an earlier post a few days ago: Mountain Expedition will be for member's only. It's too obvious to deny it. id like to see this "mountain" because it reminds me of the festival of flight lol where they had MEMBERS ONLY ITEMS... sorry for the whole member thing mimo lol its just a lil un fair..
MAybe to get to the top its gonna be like the maze where we have to go through it and thats how we get to the top. Or i think it's going to be like the game in the new ds game where u jump on the cliff things. Hey Mimo! guess what? I already have 48 stamps! I am on a roll! I just hope we have fun and earn lots of stamps!! sorry for my last post i spelled my name wrong! i cant wait mabey its card jitsue snow! Cool!I hope the new penguin style catalog comes out today! LOL the mountain expidition will be on FRIDAY the 13TH. 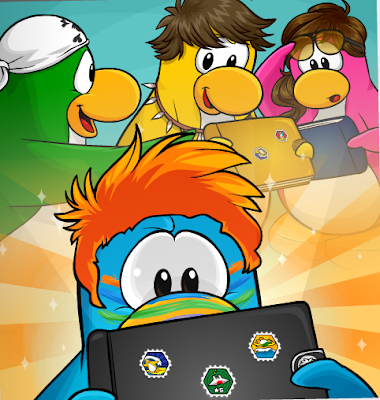 Well, I think puffles are only once a year in the puffle party. Like in '09- white and '10- orange. I don't know about Herbert. If you got Herbebrt's Revenge, the last mission says he was on the loose again. Maybe it's a Snow ninja or dojo. I do agree with that. P.S. Sorry if this is too long to read Mimo. You mean Grappling Gadget? I don't think so because we never had those items. Like a rope and a hook. Probably it's like a maze. I agree with you on that. Sorry, this will be off-topic. When people want a new catalog, and gets to the point where the town is really busy as well as the gift shop. When you log into that server, and it says "Room Currently Full" (or whatever it says), then the map appears. Click the "X" in the corner of the map. You have a blank room! Sorry, no penguins are waddeling around in it (is that how you even spell waddeling? XD) Anyway, I just thought this was cool. I recormend it with the server Abominable at 12:45 PM EST. P.S. It's really hard to find. I can take a snap-shot if it happens next time. Yea! it could be the snow dojo! Great thinking! ooo those are good ideas- i think they are really possible! I can't wait for the Mountain Expedition stamps! That will motivate more penguins to try the Mountain Expedition, too. cool hey mimo how many stamps do you have? I'm excited but wheres the blue duck. you dont get double coins on the games now, how come mimo? I have 45 stamps so far, but I can only get a few more cuz im a nonmember. They probably will be until next year when it comes back. 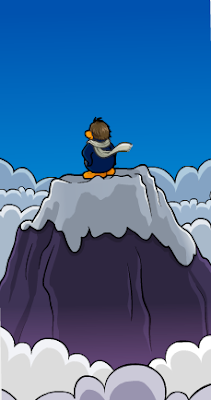 I think the mountain is for Card Jitsu Snow. It's kinda obvious actually that it is. umm were is ur stamp book?! !